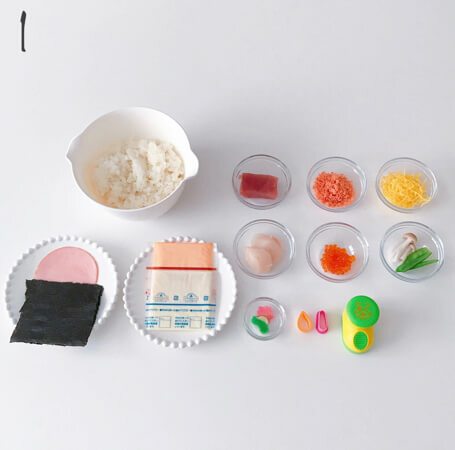 Today, you will learn how to make “Sanrio Character Temaru Sushi”! 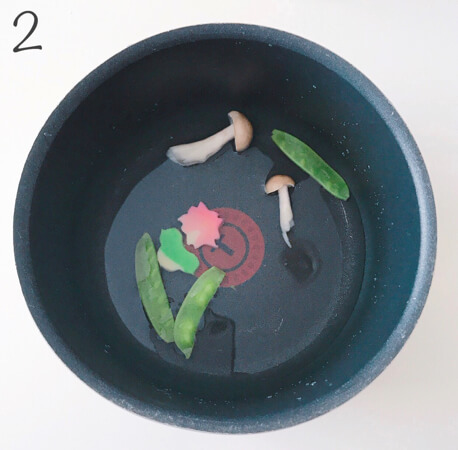 2: Prepare sumeshi (vinegared rice) and cook the mushroom, wheat starch and snow peas in shirodashi. Set aside to cool. 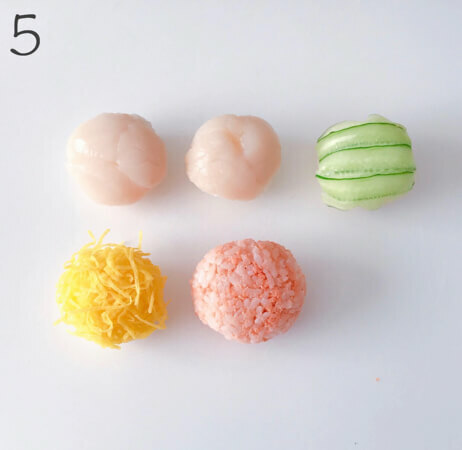 3: Slice the scallop, shape a round sphere of rice and place onto the slice (30g rice used in the photo). Wrap into a round shape with cling film. 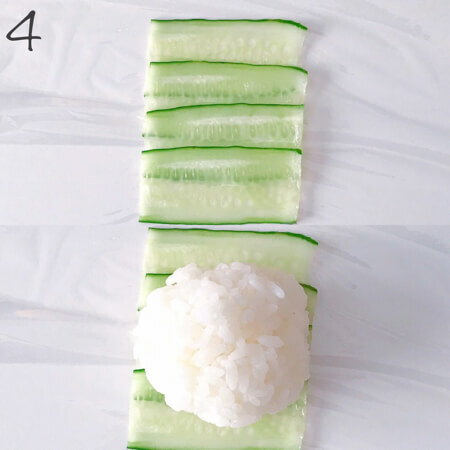 4: Thinly slice the cucumber with a peeler and put on 30g rice like before. Wrap into a round shape with cling film. Put rice onto the shredded omelette that’s on the cling film and wrap like in steps 3 and 4. 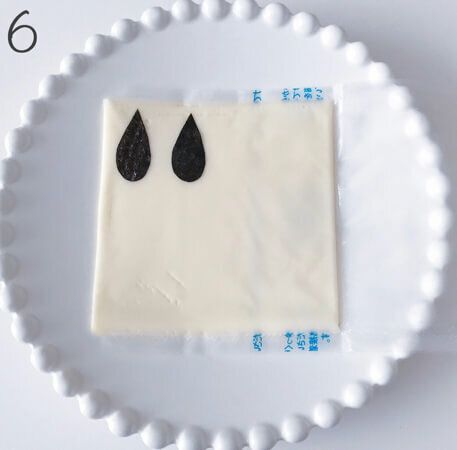 6: For Pochacco’s ears, cut the nori into ear shapes and put onto sliced cheese and cut around it with a toothpick. 7: Pochacco→Fix the ears from step 6 with fried pasta. My Melody→Cut the ham into ear shapes and fix with fried pasta. Cut the sliced cheese into an oval and place onto the rice for the face. Pompompurin→Fix the sliced cheese ears and cooked with mushroom with fried pasta. 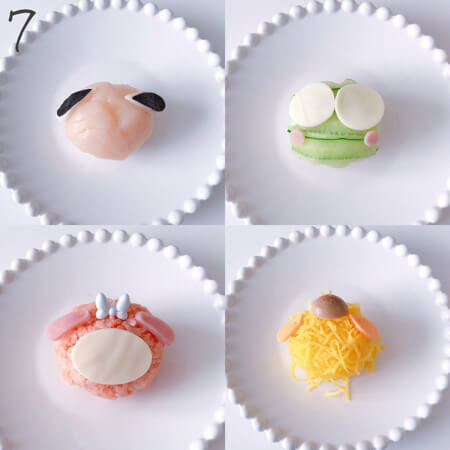 Keroppi→Place on sliced cheese eyes and round ham slices for the cheeks. Hello Kitty→Place on a sliced cheese nose. Once you have made it this far, place each one onto a plate and place on eyes and noses with hole punched nori. Create some more temari sushi using the same 30g rice and decorate with roe, wheat starch and snow peas. 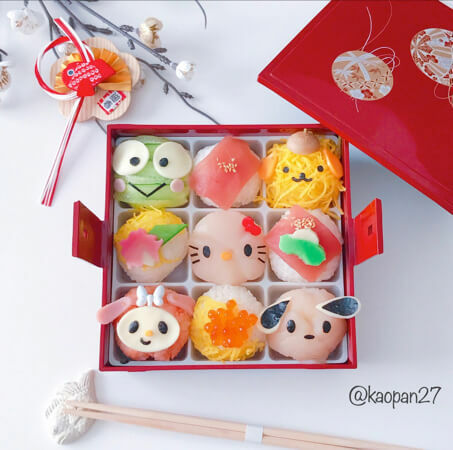 A perfect bento for New Year’s! Kaori will be making even more character rice dishes for you to try making! She has lots of character rice dishes over on her Instagram page, so please be sure to check it out.